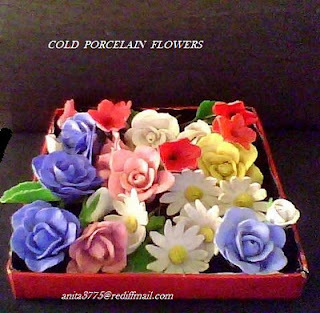 I have received a good response for the assorted flower box I posted earlier.Its easy to decorate mirrors, photo frames , nameplates and other items with these readymade cold porcelain flowers and make a personalised gift for a loved one. These flowers can be stuck on various items with a glue gun, strong adhesive or Mseal. Select flowers of your choice and make your own box of flowers ! Specific flowers can be made to order.